IF YOU CAN FOLLOW THE GUIDE LINES BELOW THEN YOU WILL HAVE A POSITIVE EXPERIENCE AT CHS. DO NOT PUT YOUR HANDS ON OTHERS. DO NOT VANDALIZE/TRASH OUR SCHOOL IN ANY WAY. DO NOT CALL OTHERS NAMES. RAISE YOUR HAND IF YOU WANT TO COMMENT, OR ASK A QUESTION. ALWAYS BE ON YOUR BEST BEHAVIOR WHEN VISITORS ARE IN THE BUILDING. We believe that no student can be permitted to interfere with another student’s right to learn. Consequences for improper student conduct involve in school suspension (ISS), out of school suspension, and expulsion. If a student acquires ten (10) Lunch Detentions during a single semester, he/she will be assigned one-day In-School-Suspension/Saturday School/After school detention. Severe misconduct may result in the student being immediately placed in In-School Suspension/Suspension/After school detention/ Saturday School. Any violation of rules established under the provision of the West Virginia Safe Schools Act will be dealt with according to that act and are listed in that section. Every Student will be walked through the rules below. A parent and their student will sign off on the rules of our discipline policy. Purses, backpacks, slingbags, or duffel-bags or any other type of must be placed in the lockers>>>> these items are not permitted in any classroom or lunch room during the school day. Unauthorized absence from class any student missing class or school without permission will receive In-school suspension/after school detention. Tardiness: students who are tardy to class will be given Lunch Detention/In-School Supension/After school detention/Saturday School/Suspension. Smoking Violation * Any juvenile who possesses or uses tobacco or tobacco products, or any student 18 years or older who uses tobacco or tobacco products on school property or at any school function is in violation of the WV State Code 16.9A.4. Those violating this Code will receive a citation issued by law enforcement. A citation will require you to appear before a Magistrate to answer the charge and the following will result. B) Subsequent offenses will result in a larger fine and a longer period of community service. * Additionally, the school will impose the following punishment for possession of tobacco. Student will be required to Join RAZE. (1st offense)You will be required to attend a Tobacco Cessation course. Should you fail to attend the mandatory course you will receive external suspension. You may also receive Saturday school or external suspension. Second and subsequent offenses will result in suspension from school. Possession of cigarette lighters is not permitted. 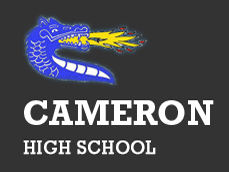 Closed Campus – Cameron High School has a closed campus. Once a student comes to school, he or she may not leave the school without permission. Students may not be in parking lots or in outside areas unless they are part of a physical education class. Presence in an unauthorized area will result in discipline referrals. i) 1st Offense – Three (3) Lunch Detentions. ii) 2nd Offense – Three (3) Lunch Detentions. iii) 3rd Offense – One (1) In-School Suspension/After School Detention. Sexual Misconduct –up to a 10 suspension. 1st Offense  Lunch Detention. 2nd Offense Three Lunch Detentions. 3rd Offense In-School Suspension/after school detention. Electronic Devices: cellular phones, digital cameras or recorders, laser pointers, ipods and DVD players are not permitted in school. 2nd offense Electronic device confiscated for 7 days. 1 In-School Suspension/After school detention. and parent has to pick up. Any student who refuses to submit their phone/electronic device to faculty/staff when asked may be suspended. Any student who disables or tapers with their device before submitting it may be suspended. Any student that uses their electronic device to bully or harass during the school day and during extracurricular activities may face suspension and the consequences above. The playing of card games or any other games of chance is not permitted in school. Any student who refuses to report to the office after being sent for disciplinary reasons will be suspended from school for three (3) days. confiscated and may be given discipline referrals. Students who refuse to give up items will be sent to the office. 12.Students are not to have in their possession ANY knife or knifelike object regardless of the blade length. Possession of such object can result in Explusion (ONE YEAR OUT OF SCHOOL). PLEASE CHECK YOUR POCKETS BEFORE STEPPING ON SCHOOL PROPERTY. Any type of defacing/vandalism of school property will result in suspension up to ten days or more. Writing on desk or bathroom walls may be a ten day suspension. 7th and 8th graders are not permitted to use or have ink pens. Student Agenda: Every student will be required to have an agenda. The agenda is a personal organizer, and is the only way student will be allowed to get a hall pass. If a student loses their agenda they will be required to purchase another one. Students that use another student’s agenda for a hall pass will receive lunch detention. Students are not allowed to get a hall pass to use the office phone. The only way students can report to another class/room where he or she is not assigned is if the assigned teacher receives written notice prior to that student leaving. Students can only make phone calls out from the office phone during their lunch. Students are not allowed to use faculty phones. 4-9 offenses 3 lunch detentions/Internal/Afterschool detention. 10th Suspension/After school Detention/In-School suspension. 20. Students can be disciplined for inappropriate classroom behaviors such as cheating, sleeping in class, not turning in assignments, etc. Students can receive discipline referrals for these behaviors. 24. Students are never permitted to let any non-employee into the school. 25.Student have to clean shoes/boots before entering school. 1st offense -Warning. 2nd lunch detention. 26. Students are not permitted in faculty work areas. No students are permitted to be on the track without a school employee’s supervision. No sunflower seed in school. Senior high students are not permitted to in the Middle School section at anytime. Senior high student that have obtained a pass maybe permitted in the Middle school area. Students who accumulate 10 lunch detention/discipline referrals will be assigned one (1) days Internal Suspension or After School Suspension. Teachers are required to notify students that they have been assigned Lunch Detention. Our Dean of Students will also inform students of Lunch Detention assigned upon their arrival to school. Students that are assigned Lunch Detention are to report directly to the Lunch Detention room before going to lunch. Again, at the beginning of lunch, students assigned Lunch Detention are to report to the Lunch Detention room, not the cafeteria. Students who are late will be assigned another day of lunch detention. Students that miss lunch detention may be assigned additional Lunch Detention, Internal Suspension, After School Detention, or Saturday School. Students who violate Lunch Detention rules may be assigned more Lunch Detention, Internal Suspension, After School Detention, or Saturday School. Lockers are assigned to each student. Some students may need to share a locker with another student. Students may go to their lockers before and after school and between classes. The lockers belong to the school and therefore, the Principal or her designee may, at any time, have access to the lockers. Only school owned locks are be permitted on the lockers in the building. A rental fee of $5 will be required to obtain a lock but will be returned at the end of the school, if the lock is returned in good condition. All students attending Cameron High School are expected to follow the procedures set forth under the student Code of Conduct. The following offenses may result in suspension and/or expulsion. b) Disruption of the school’s function to educate suspension and charges filed. o) Bullying, Harassment or Intimidation. p) Failure to serve assigned detention. q) Habitual violation of school rules or policies. The student will be advised by the Principal why suspension is warranted and will have the opportunity to defend himself/herself. The parents or guardian will be informed by the Principal of the impeding suspension and have an opportunity to be present at the standards discipline procedure. The above procedure may be delayed until after suspension only when the misconduct poses a continuing danger to persons or property, or an ongoing threat or disrupting the academic process. There is a definite relationship between good dress habits, good study habits, and good school behavior with a successful educational experience. A person demonstrates maturity and good judgment by choosing clothes appropriate for the occasion. To help insure that our students are not distracted by certain dress or grooming of a student, the school will require appropriate personal grooming. Extreme hair color or extreme hairstyles will not be permitted. Clothes should be neat, clean, safe, and reveal good taste. Clothes that are in question will go before the Dress Code Review Board. Due to potential health and safety problem, students must wear shoes. Flip flops will not be permitted. Shirts and blouses must meet the top of the pants or skirt. Tube tops will not be permitted. T-shirts designed with low-cut armholes, see-through shirts or blouses, tank tops, or revealing tops of any kind must be worn with an appropriate cover shirt or undershirt. Shirts and blouses that show cleavage will not be permitted. Clothing, badges or patches with suggestive phrases, slogans, obscene or questionable printing or pictures will not be permitted. Any clothing advertising tobacco, drugs, or alcoholic beverages will not be permitted. Clothing must be no shorter than the tips of the fingers while standing, arms and fingers extended by our side. NO HOLES WILL BE PERMITTED IN JEANS OR SHORTS. Sunglasses are not to be worn in school unless prescribed by a physician to be worn indoors for medical reasons. Hats, hoods, headbands are not permitted to be worn during the school day. If hats are worn to school they are to be left in lockers or they will be confiscated. Only tops with a two-inch strap will be permitted. No halter tops or backless garments will be permitted. Students are not permitted to wear jeans/shorts that expose undergarments. Wraparound skirts must be pinned. Button-up skirts must be buttoned up. Tight fitting sweat or bikers wear are not acceptable. Tight fitting stretch pants or shorts such as: Yoga pants, tights, leotards are not permitted-lunch detention. The faculty will evaluate the appropriateness of the attire and refer inappropriate attire to the dress standards discipline procedure. Students will receive three lunch detentions for the first dress code infraction. The second infraction may be Saturday School. Our Dean of Students/Dress code committee will also inform students of Lunch Detention assigned upon their arrival to school. iii. Students that are assigned Lunch Detention are to report directly to the Lunch Detention room before going to lunch. vii. Students who violate Lunch Detention rules may be assigned more Lunch Detention, Internal Suspension, After School Detention, or Saturday School. Students absence is to be verified by a Parent or Guardian within 24 hours of the absence. If a student is unable to attend school on a particular day, the school is to be notified by telephone on the day of the absence. Parents are allowed five parent excuses per semester. Yet parents have to call and excuse their student within 24 hours. We strongly recommend that you provide the school with a note for documentation purposes when your student returns to school. Doctor excuses have to be turned in within five days of your students return to school. Failure to do so will result in those absences turning into unexcused absences. Every absence that does not have a permissible excuse or exceeds the five parent excuses will result in an unexcused absence. If a student wishes to forego exclusion from extracurricular activities they must attend a Saturday school for every unexcused absence. Their days have be to made up with Saturday school participation before the student can participate in extracurricular. Students who accumulate 10 or more suspended days will be excluded from extracurricular activities. Athletes that miss 2.5 unexcused absences during their season will sit out a tenth of that sports season. Athletes that accumulate more 5 or more discipline referrals during a season will have consequences.